Voici ma participation au défi de la compagnie Blue fern Studios. Encore une fois un sketch très inspirant! Here's my participation for the monthly challenge on the Blue Fern Studios blog. Once again a sketch very inspiring. What a beautiful layout, and a great take on the sketch. I love the teal and brown together. 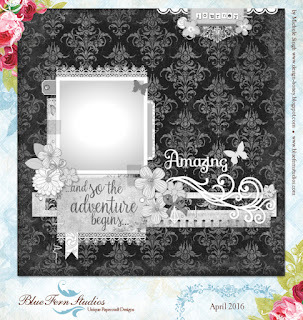 Thank you for joining us at Blue Fern Studios for our sketch challenge this month. Thank you! I was inspired by your beautiful papers collections!